“I want my VMG” why are we in Dire Straits? In a previous post I complained about the inability of expensive chart plotter devices to calculate proper routes by assessing the correct Course to Steer (CTS) using tidal streams and wind data. If you are a sailing vessel then trying to steer along the “projected track” line that these plotters are fond of displaying is the least efficient Course to Steer – even if you are sailing dead down wind. To add to this issue your expensive chart plotter from Raymarine or Garmin or Foruno will be displaying a VMG that will mislead you into steering a poor course – and if you tack the chart plotter will not be able to tell you what your ETA is either. As readers will know I have a Raymarine C120 so I refer to that device as I am most familiar with it, but I am pretty certain that my comments apply to all its major competitors. Even the excellent and lower priced charting software for PC’s such as SeaPro and Neptune can’t help you – but at least they can plot CTS correctly! Remember I am discussing the task facing a sailing vessel which is subject to tidal streams and wind to a much larger degree than our powered friends. Although powered vessels in heavy seas or winds may also wish to steer a more comfortable or safer course rather than slavishly follow the “projected track” line. Why is VMG so important? – After you manually calculate your route and your CTS, you will probably be unable to steer exactly along the planned route, but will instead have to tack to reach each successive waypoint, depending on the wind direction. If you tack at the right time, and hold the correct bearing, you can make a significant difference to the time it takes to reach your destination (ETA), something that your crew will thank you for by buying all the drinks when you arrive! Before you depart, you will have the pleasure of staring at your $3,000 chart plotter while calculating your route manually with charts, tidal atlas and pencil. After you set off you will than have the added pleasure of ignoring the VMG and ETA readings on your chart plotter or even watching the plotter blank the ETA when it gives up because it thinks you are way “off course” when in fact you are tacking to optimise VMG. As a sailing vessel your goal will be to maximize VMG upwind and VMG downwind. But your chart plotter will invariably be displaying VMG to the mark i.e. the next waypoint on your route. This means that as you tack the VMG to the mark will start to decrease even when the boat maintains the optimum pointing angle, suggesting that the boat is sailing less and less well even when it’s not. Then as the boat reaches the imaginary layline (see diagram) the VMG on your chart plotter will read zero – past this point it may even be negative as you lose ground relative to the marked waypoint. Laylines are imaginary lines to the windward mark based on the optimum pointing angle. If a boat tacks onto the layline, it can just make the mark at the optimum pointing angle. If it goes beyond the layline, it’s sailed too far or overstood the mark, and will lose ground to boats that stay within the laylines. Thus the two laylines form a cone in which a boat should normally stay. If a boat tacks anywhere within the cone it will be making progress towards the mark – so it could for example do lots of small tacks and zigzag up the rhumb line towards the mark – but this would be very expensive on effort and also would try the patience of your crew! To add further complexity there are tidal streams to take into account. These will tend to make the laylines curved instead of straight – they may even be S shaped. Finally you wont be able to sail in a straight line on the tack in any case because you will be trying to keep the optimal pointing angle. All these factors cry out for a fast real time calculation from your expensive computerised chart plotter – alas – all you have is VMG to the mark – the next waypoint – as if you are steering a straight line. All is not lost however! – you can get an approximation of the dynamic effect of wind, COG, tidal streams by watching the rate at which your chart plotter changes the VMG. Execute your tack and when you see how fast VMG is degrading as it reaches say 30% of what it was at its peak then tack. If you see VMG reach zero you need to tack immediately or you will definitely lose ground with regard to the target mark – this is the point where you are crossing a layline. The VMG reading will at least be telling you when you are crossing the imaginary layline – and dont worry if the bearing to the waypoint is not always the same – this will be the effect of changing winds and local tidal streams at that point – remember the layline could be curved. When a boat sails higher than the optimum pointing angle, VMG upwind goes down because the loss in speed is greater than the decrease in distance. Likewise, when a boat sails lower than the optimum pointing angle, VMG upwind goes down because the increase in distance is greater than the increase in speed. Hence, VMG upwind is very useful, because the optimum pointing angle can be found simply by maximizing VMG upwind, and since the best VMG upwind will be constant for a given set of conditions (e.g., wind speed). So somewhere within that cone is the optimal route, that would maximise VMG – the problem is how do you know when to tack? My gripe is that Raymarine (an all the others) have all the data they need pumping into their device – but they just dont calculate this optimal route. And another tack tic (pardon the pun)…has been posted by Captain Roger H Strube. In his article VMG for Dummies he describes a way of using the chart plotter to give you a VMG to wind that can then be maximised on each tack – but you must still sail within the laylines of course. Are there any solutions on the market? – There are small devices on the market that are used by racing crews such as a the Velocitek and the Nauteek that go some way to assisting in this decision – but for a cruising sailor it is deeply frustrating to know that the information could be displayed right on your chartplotter – but it is simply not there. There are at least three examples of software packages on the market that do however try to stand up to this chalenge. One such package is the Advantage Racing Software. This means that they not only calculate the route with the tack sequence but the compare whether starting on starboard or port tack gives an advantage caused by the actual tidal current and the polar diagram for your boat. The “Advantage Router” considers all possible routes to find the quickest. If you have some idea of how you want to go, or want to compare two or more possibilities, Advantage offers another option. You can pick ‘Course Solution’ and the program will use boat polars and wind and current data to compute current-corrected headings, distances, transit times and time of arrival at each waypoint, as well as total time and distance. It only takes a few seconds to define a ‘Quick Course’ by point-and-click, so this method can be used even when time is short (say in the middle of a leg, to compute the difference in time of two alternatives to avoid an obstacle). Course Solution can also be used for cruising, or when under power, to compute how long a transit will take, perhaps at different starting times when tidal currents are a factor. You can define overall boat or wind values, or modify these leg by leg. The chartplotting software from Software-on-Board (SOB) also draws what they refer to as the “Wind Shadow” which is a representation of the cone created by the laylines within which the boat should tack. Although they do not go on to calculate tacking angles or corrected ETA’s. Among its many innovative features, SailCruiser will display tacking on multiple waypoints. 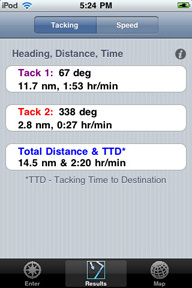 It will display tacking routes and Tacking Time to Destination (TTD) around an entire course. Polar Plots can also be entered for individual boat performance. Craig Summers is based in St. Margaret’s Bay, Nova Scotia, Canada. He is a mathematician with expertise in computer modeling and electronics. He is also an experienced Bluewater cruiser and producer of the acclaimed Cruising DVDs series, an interactive cruising guide that covers the entire historic route from the coast of Florida across the Gulf Stream, through The Bahamas, The Turks & Caicos, The Virgin Islands, and into The Caribbean. Leaving chartplotters aside there are other options too – at even lower prices. These Sailing GPS devices will be shipping in 2010 with a projected retail price of about $300. But if you already have an iPhone – then you are in luck because the software is also available as an app for iPhone. Check out this YouTube video of how to use the iPhone Sailtimer app. The SailTimer app is a $14 app for iPhone and iPod. SailTimer has a LARGE display of speed in knots that uses the GPS in iPhones. But even when there is no GPS (on an iPod) or no internet connection (for Google Maps), you can get some very helpful tacking information. Finally – if you just want to play around at home with the concepts – try the FREE GoogleMaps SailTimer. Plot your optimal tacking routes on Google Maps online. View a satellite photo, a road map or a hybrid of the two. In the screenshot below, optimal tacking from Brighton to Dieppe is being plotted on Google Maps. Here is set a 25kn SSE wind so that it would be a hard beat to Dieppe. Interesting to compare this with my CTS – you can have a lot of fun with this. There is no hydrographic depth data with Google Maps, and Google Maps only works with an online internet connection. But this gives you a chance to test out the SailTimer algorithms and compare it to your own experience. 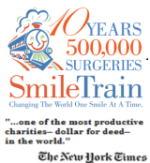 All the applications of Craig Summer’s software can be seen here. A good exposition of the VMG problem can be found in this article by John Navsa , this article by OceanSail, and also in the book by Bob Sweet called the Weekend Navigator. Now let me come back to my gripe -I realise that the Furono FI-503 displays “VMG to windward” as does the Raymarine ST60 – of course they dont explain how they calculate this figure. My point is that having gone that far why not put up a useful display on the chartplotter screen like the small companies above have achieved. Also keep a log of the boats actual performance and thereby create a useful polar diagram for your particular boat ie. learn the boat from its real performance and thereby improve the route planning with each passage. So what are the major chartplotter manufacturers givin us – oh yes 3D aerial photography, and widescreen display panels…..hmmm. Russ November 27th, 2009| One comment so far - be the next!|Tags: Navigation - Raymarine - Software - VMG. 1 comment to “I want my VMG” why are we in Dire Straits? Routing 4 of 7 : Boat characteristics & learning to Wally! Garmin Mobile XT & Bluechart Marine Charts on a phone?